Whether you’re taking a trip to the vets, or your kitty is accompanying you on a fun road trip, you’ll likely need a cat carrier to help ensure they get around safely. Keeping your pet in a comfortable carrier as they travel is a great way to prevent them from causing distractions, and keep them in one place on the move. Pet carriers are also an absolute must if you’re travelling with your pet on an airplane, as most airlines will only allow them to travel if they’re properly secured. With these myriad uses, keeping a cat travel carrier around is essential for a happy and healthy pet, and it should come as no surprise that you’ll be spoilt for choice when it comes to choosing one. With this in mind, we’ve scoured the market for the top 10 best cat crates and carriers around, so you can make an informed decision that works for your feline friend. We’ve also answered some common questions about these products, and how to use them, helping you to travel with your cat in confidence. PetLuv have nabbed the first spot on our list with their premium soft cat carrier. Their product offers the optimum combination of durability and comfort, allowing your pet to travel in luxury. The spacious interior is accommodating enough for pets weighing up to 45 pounds, so you can rest assured it’s suitable for felines of all sizes. In fact, PetLuv say their unique design provides pets with four times the space of conventional carriers. On the bottom of the carrier, a soft but supportive pillow gives cats a comfy spot to relax on the go, while mesh panels make for great airflow and visibility. It’s easy to handle too, thanks to an adjustable carry strap with padded handle, secure, lockable zippers, and seat-belt loops to keep the carrier safely in place in the car. The cat travel bag also includes four access panels, so you can pop kitty in and out from any angle for your convenience. The next cat carrier bag to earn itself a spot on our list is Necoichi’s practical and budget-friendly offering. Their collapsible carrier folds down for convenient storage, and features a lightweight made from sturdy but soft polyester. This fabric is easy to clean, too, and features mesh panels allowing your cat to peek out, and be properly ventilated. The soft but durable carry handle makes transportation comfortable for you, while the carrier’s spacious design makes it comfortable for kitty. It also features a lockable zip for maximum security. Necoichi’s design is suitable for felines weighing up to 17 pounds. If you need to fly with your feline friend, this airline approved pet carrier could be the perfect solution. Pawfect Pets’ handy carrier is cabin sized, allowing it to be tucked under the majority of airline seats. It’s stylish, too, available in four attractive colors that you and your pet will love. The carrier is made from soft but tough fabric, resistant to claws and teeth to keep cats exactly where they should be. It includes a soft fleece lining your pet can settle down on for the duration of their trip, and mesh panels for improved ventilation and visibility. It has three doors, allowing pets to be loaded from left, right, or top, and a zipper pocket that’s perfect for storing essentials. The bag is great for cars as well as planes, too, thanks to its two seatbelt buckles. Customers say they carrier is well-made and stylish. Amazon’s handy cat and kitten carrier is available in three different sizes, making it ideal no matter the size of your pet. It’s made from lightweight and durable mesh fabric, so pets can see out on the go, and enjoy a gentle breeze. The carrier also features a wide strap and carry handle, making it comfortable to carry, even over long distances. It’s also machine washable for your convenience, and features a fleece lining so your cat can sit comfortably and settle in for the ride. Beneath, a removable solid base makes the carrier rigid when the need arises. As well as this, the carrier is cabin sized, and approved for travel on most airlines. Pets weighing up to 16 pounds can find a comfy travel spot with this simple but effective mesh carrier. Paws and Pals are a familiar name on our lists – and for good reason! Their products are excellent quality, and this large cat carrier is no exception. The attractive fabric carrier is available in 11 bright colors, so you and your feline friend can travel in style wherever you roam. It also features a removable fleece bed, padded shoulder straps, and a removable ID tag, keeping your pet comfy, secure, and safe. The breathable fabric makes for excellent airflow, while its machine washable design allows convenient cleaning. On its side, handy zipper pouches allow you to store your cat’s travel essentials, and treats. Owners report that the sturdy design keeps pets safe, and is easy on your shoulders. Handy straps on the side of the carrier mean you can attach it to your car’s seats with ease. The next cat carrier to make it onto our list is Pet Magasin’s Luxury soft-sided option. The airline approved case is the perfect size for tucking underneath plane seats for safe and secure travel, wherever you’re heading. It’s available in four vibrant colors, so you’re sure to find something eye-catching that you and your pet love. It also features sturdy piping along its edges, providing a secure spot for pets to relax throughout the journey. The luxury fabric is is lightweight and durable, so the carrier is sure to last and last. Meanwhile, a padded shoulder strap makes it comfortable to carry, and mesh panels for visibility and ventilation. It also folds down flat for convenient storage, and can be easily wiped down thanks to its waterproof fabric. Many users say their cats love this carrier so much that they even seek it out again when they’re safely home. Available in three different sizes and seven subtle color-schemes, Sherpa’s pet carrier purse is the perfect solution whether you’re travelling by road, air, or water! The bag’s unique spring wire frame allows it to be squeezed into most small spaces – including under airline seats. It also features mesh vents for optimum airflow, ensuring your feline friend doesn’t get too stuffy. Lockable zippers allow you to secure your pet in place, while a padded strap makes for comfortable and convenient carrying. The carrier also has a seatbelt-compatible strap, allowing you to secure it to your car seats with ease. Each case comes with its own faux lambskin liner, so your cat can relax in comfort throughout their journey, and a rear pouch for storing pet travel essentials. Finally, the case unzips at both the top and front, allowing you to access your pet from any angle. 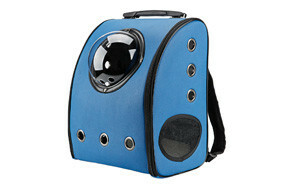 The first plastic option to earn itself a spot on our list is this small pet carrier by SportPet. Available in two sizes, its foldable design collapses down, making it a great space saver when not in use. The carrier is made from sturdy, durable plastic, which is easy to wipe clean and maintain. The large opening is perfect for cats to climb in and out of without fuss, and strong, solid clasps hold the door in place once closed. The comfort grip handle makes holding on almost effortless, and SportPet have included a soft but supportive fleece bed with each of their carriers. This bed can be easily washed by simply popping it in the washing machine, while vents in the side of the case help to keep it fresh. Owners say that cats love it: the carrier offers a comfortable and secure space for them to chill out for the duration of their journey. Texsens’ unique cat carrier backpack is comfortable to carry and gives your feline friend the best possible view on the move. Kitties will love riding up higher than conventional carriers allow, and thanks to the transparent plastic dome mounted into the pack, they’ll have an excellent view wherever you roam. The adjustable padded shoulder straps allow you to carry the bag in comfort, while mesh ventilation panels, along with a removable layer of padding, allow your pet to travel in comfort too. A built-in security leash keeps cats in place should the bag become unzipped, while top and side openings make it easy to manoeuvre pets in and out of the carrier from any angle. It’s available in six different colors, too, so you’re sure to find something to your unique taste. Necoichi have earned themselves a second spot on out list with their versatile cat cage; the last option on today’s list. If you have more than one cat and want them to travel together, this could be the perfect solution for you. The spacious carrier takes up minimal space in storage, but pops up in seconds to give cats a safe and comfortable spot during transit. 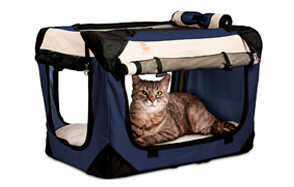 Made from soft but durable mesh panels, the carrier offers cats the optimum balance between visibility and privacy, and they’ll enjoy it as their own special space in the home as well as on the go. It’s the perfect size to lay across the back seats of your car, and is easy to wipe clean should it become dirty. These 10 carriers are the best the petcare market has to offer, and we’re confident that you’ll find the perfect solution for your feline among these diverse options. With so many carriers to choose from, finding the best one for your needs can be a challenge. That’s why we’ve put together this handy buying guide! We’ve also compiled some useful advice about how to travel with your cat as safely and comfortably as possible. 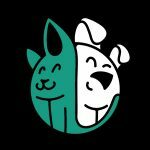 What to Look for in a Cat Carrier? When you’re choosing a cat carrier, there’s plenty to think about - below are some key features to look out for in a quality carrier, and some factors to consider that might influence your decision. It might sound obvious, but the best place to start when choosing your carrier is to make sure it’s big enough for your kitty! We’ll discuss this in more detail below, including how to properly measure your cat for a carrier. The next consideration to bear in mind when selecting a cat carrier is what material it’s made from - you’ll usually choose between fabric and plastic. Fabric carriers are lighter, and can often be folded down for easy storage. Because of their flexibility, they’re often best for air travel. Plastic carriers, on the other hand, are more rigid, and stronger, but often provide less room for your pets. Whether you’re travelling by plane, train, or automobile, it’s a good idea to select a cat carrier that fits with your plans. If you’ll mostly be using the carrier to travel by car, look out for a model with seat belt straps, and for planes, check it’s approved by your favored airline. Another factor to bear in mind is your pet’s safety and security. Look out for a carrier that can be securely closed, to prevent wiley felines from squirming out. Many fabric models feature lockable zippers, scratch proof mesh, and double stitched seams. Plastic carriers are more secure naturally, thanks to the rigidity of the material - when shopping for this type of carrier, look out for a good clasp system to ensure the door stays shut while your cat is inside. Chances are, you’ll be using your carrier on more than one occasion, so ease of use is vital. Look out for carry handles, adjustable straps, and plenty of padding to distribute the weight of your pet as widely as possible for a load that doesn’t hurt your hand. If you’re concerned about your shoulders, it could be worth choosing a backpack style car carrier, such as number nine on our list. Backpacks are designed to help you carry weight comfortably and without doing any damage. As with any purchase, your budget will also inform your final decision. Fortunately, cat carriers exist to meet the needs of any budget, and you’ll be able to find a quality product for as little as $20. Costlier options will likely mean more features and style options, but there’s no need to splash out when it comes to this essential piece of kit. Why Do You Need a Cat Carrier? What Size of Cat Carrier Do I Need? Have your cat stand up and fetch a tape measure. Measure them from the tips of their ears to their toes, and from the tip of their nose to the end of their tail, before making a note of each measurement. To ensure your pet has enough room in the carrier, add a few inches to each of these measurements, and use the resulting figures as a rough guide. You can check these ideal measurements against those given by the manufacturer to make sure you get the best possible fit. When buying for a kitten, ensure you leave plenty of room for growth. For us, the best cat carrier about right now has to be PetLuv’s aptly named Happy Cat Premium. With five different colors and three different sizes to choose from, the fabric carrier looks great no matter your taste and the size of your cat. 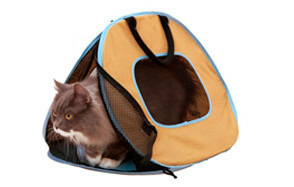 Its spacious design gives kitties plenty of room to spread out and relax as they travel, while strategically placed mesh makes for excellent ventilation and good visibility, so your feline friend can keep cool and peek out. The adjustable seat belt loops make it easy to secure in any car, and reinforced seams, along with lockable zippers, keep your cat as safe and secure as possible. Four different access panels allow you to take your cat in and out of the carrier from any angle, too. Finally, the carrier is comfortable and easy to carry, thanks to an adjustable shoulder strap and padded carry handles.